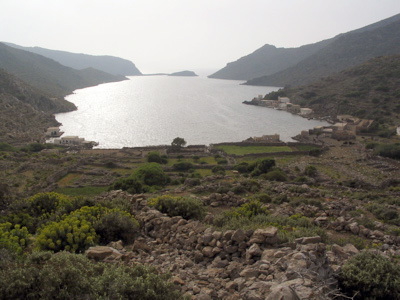 Tristomo is the northernmost, most remote village of Karpathos. The village is located on the eastern end of Tristomo harbor, a natural harbor with three openings on its western side. This is where Tristomo, meaning "three mouths", gets its name. Only a couple of families live here year-round. There is no road to the village, no electricity, no water, no restaurants, and no accomodations. And considering that there are enough signs of so-called "progress" on other parts of the island, this is most definitely a good thing. This is truly an exciting village to visit, especially when hiking to it. The peace and quite alone, as well as breathtaking views of the last remaining unspoiled part of the island are worth the trip. You can imagine how wonderful Karpathos used to be before it was decided that tourism was more important than tradition. If you decide to come to this village bring enough water and food with you. This is particularly necessary if you're planning to hike the ancient path from Avlona. It is possible to get to the village by boat, but there are no regularly scheduled boats that travel to the village. Unfortunately, the village hasn't completely escaped the modern age: a lot of garbage washes into the harbor and onto the shores of the village. With no one apparently willing to spend some time to clean the mess up, it has accumulated over time. There are also some archaelogical sites near the village, as well as some interesting structures to check out in and around the village.